The City of Durham just acquired an abandoned railroad track encircling downtown Durham. It plans to turn it into a bike trail park. Will it turn into a path of evictions? We can create our own vision of the space. 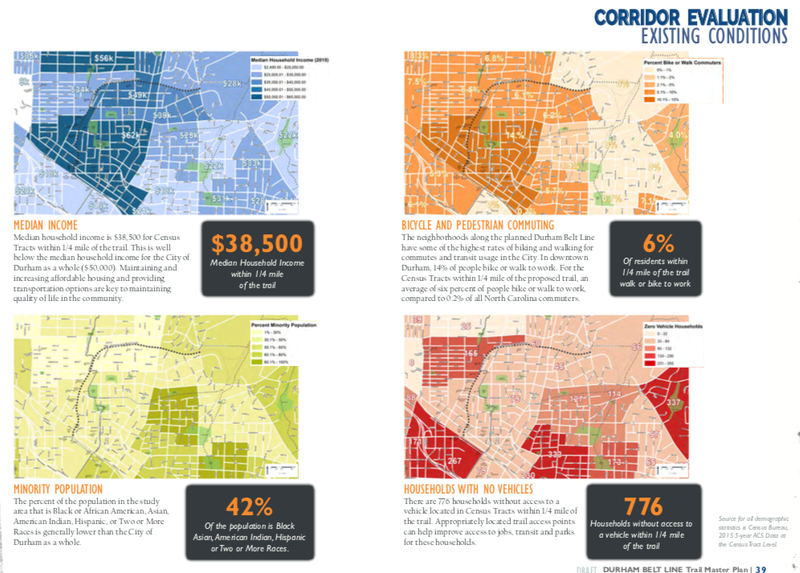 While intended as a transportation pathway , the development associated with the Belt Line will likely create a physical, cultural, and economic access barrier in areas that have been historically segregated and disinvested through redlining and forced segregation—unless coordinated, social equity policies are adopted at the same time. The Durham Belt Line master plan has not yet been approved so there is still time for a coordinated community vision and plan for equitable development. 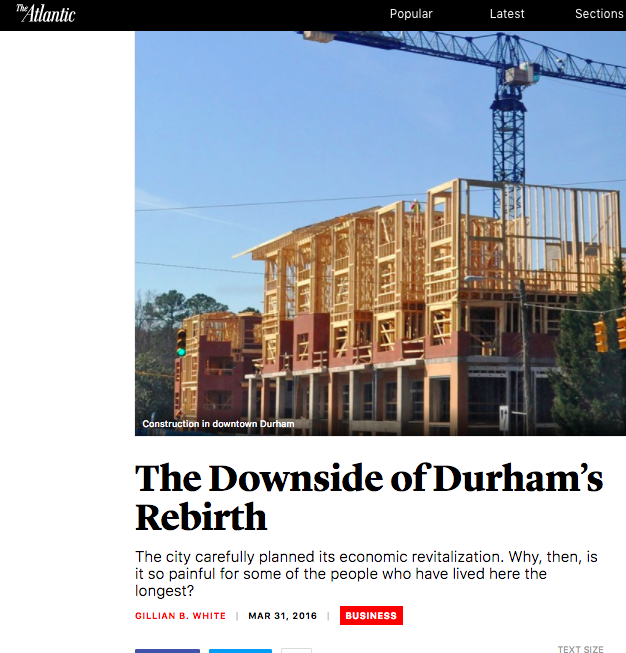 The equitable development of this asset presents a unique opportunity for Durham. The trail was first envisioned in 2001, but the land was finally acquired in June of 2017 through a bridge deal with The Conservation Fund. The City of Durham officially bought the land for the track in spring of 2018. The 1.7 mile Belt Line trail will connect with the R. Kelley Bryant Trail, The Goose Creek Trail, the American Tobacco Trail, and the South Ellerbe Creek Trail (including the stormwater remediation site) to create a small loop encircling the city. This will connect with other existing trails to eventually create a 40 plus mile 'Great Loop' linking Durham to Cary. While intended to create transportation equity for those without vehicles, encourage low carbon transportation like biking, and public space for recreation, this great loop will likely spark property speculation and inequity unless a coordinated equity response and plan is adopted. Durham is already experiencing extreme displacement and evidence so far shows that the Durham Belt Line will dramatically increase that. There are 900 evictions a month in Durham — the highest in the state of North Carolina. That's 4.2% of the city's population evicted in one year. Evictions include cultural displacement as well as physical displacement. Precendent Belt Line and Linear Parks from around the world have resulted in extreme displacement. CUNY professor's Lewis and Gould's 2017 book concludes after researching 5 parks in New York City. 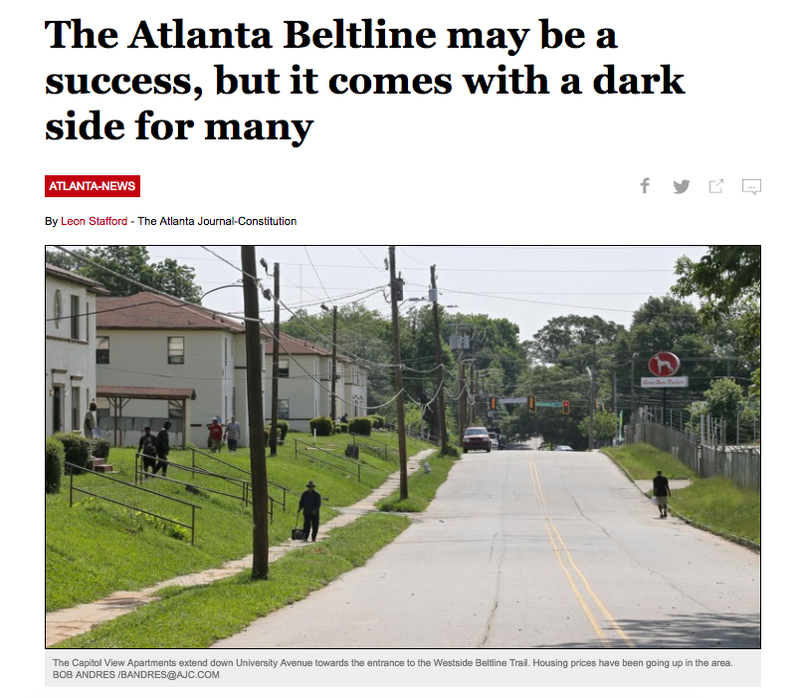 Even the founders of much lauded projects like The High Line and The Atlanta BeltLine admit that they have failed the existing community. We were from the community. We wanted to do it for the neighborhood. Ultimately, we failed.... Instead of asking what the design should look like, I wish we’d asked, ‘What can we do for you?’ Because people have bigger problems than design. This displacement has been documented by quantitative research. Barcelona Laboratory for Urban Environmental Justice and Sustainability has documented this issue calling green parks developed without community want, GREENLULUS. Their 5 year quantitative study, Green Trajectories, they look at the effects of greening and equity in 50 global cities over a 25 years span. Federal funding for the Durham Belt Line park was provided by a Federal TIGER grant in 2014, with the promise of providing 'Ladders of Opportunity' for those without access to public transit and from communities that have suffered from a legacy of redlining and disinvestment. A project that does not provide that, and instead creates "Ladders of Displacement" for those who do not own a vehicle is a misuse of funding. Durham is still in the midst of a master planning process for the BeltLine park. There is still an opportunity to organize and shape the way the space is developed in way that is equitable and truly sustainable if the community is aware of the project and can help control the outcomes. The Durham BeltLine masterplan draft was released on April 25. Please share this upcoming development with your community, submit comments to the planning committee and also to the City. The precedents of inequality from other Belt Line parks have attracted funding and investment from a wide range of philanthropists, and could in Durham as well. The development of the park creates an opportunity for cross agency and interdisciplinary thinking and truly sustainable solutions to create a Durham that works for all. The Durham Belt Line is intended to become a 40 plus mile bike loop which connects all the way to Cary and around the triangle.